TTTech Automotive has developed a high-performance platform solution for the automotive industry that specifically addresses the rapidly increasing requirements for driver assistance systems. These include automatic parking, piloted slow-driving at traffic jams, automatic headlights adjustments and road sign recognition, lane assistance, adaptive cruise control and emergency brake assistance. The developed architecture for advanced driver assistance systems is very scalable. The design of multi-core SoCs, which can run in parallel with different operating systems (AUTOSAR, VxWorks, Linux, etc. ), depends on the number and power requirements of the entirely encapsulated applications (currently several dozen simultaneously). An important part of the platform controller is TTTech’s Deterministic Ethernet. This reliable and real-time-capable Ethernet backbone solution enables the combination of data traffic of different criticality with a high data throughput. This sophisticated software package is located and running as a middleware between CPU-level and the integrated applications. It provides each application with CPU-time and memory needed but at the same time separates hardware from applications. Therefore origin of data and data usage are strictly decoupled (location transparency). Further benefits include simultaneous support of various safety levels while ensuring “Freedom from Interference” and ease of software integration. 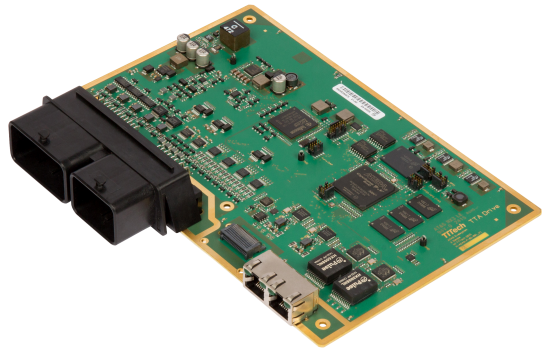 The AthosMotion platform has a scalable architecture that can be configured flexibly to fit customer requirements for building a series production ECU, without the need to modify application software. In prototyping use, the AthosMotion platform is easily extended with external building blocks e.g. for image processing. An external Deterministic Ethernet switch can also be used to integrate additional AthosMotion modules for simulating a fail-operational setup. Due to provided co-simulation a remarkable amount of time can be saved during the development process. Each supplier tests and integrates applications individually into their respective execution boundaries set up by TTTech. For functional testing all applications are then integrated by TTTech and immediately able to run together. Thanks to the overall concept, violations by SWCs, bugs are detected very easily.